From Goodreads.com: I have lost everything. To begin with - I usually tell my readers that all of the Eagle Elite books are stand-alone (meaning there is a beginning, a middle and an end), and while this is still true, I would have to HIGHLY recommend that you read Elude (Eagle Elite #6) prior to reading this one. Its not necessary per-say (in that you can still understand what is going on in this book without reading it), however - there is just so much of a story in Elude that if you don't read it prior you will be missing out on one hell of a story. And one that well help make this one a bit easier to understand (at least in so far as why certain characters act and react the way that they do). Now that I've gotten that out of the way, lets more on to the review. As someone who has read this series from the beginning, I felt as though I already knew everything there was to know about Sergio. Hell, I was even witness to what I thought was his redemption (in Elude). However - none of that prepared me for Empire. This was one of those stories that captured your attention from the beginning, and forced you to hold on while you were sent on the grueling (and sometimes heart-breaking) world of the Mafia. Sergio is still very much reeling from the loss of his first wife Andi - however he does what is expected of him and marries Val anyway. And while he's not over his wife by any means, this story is more of a study in grief and how does one really let go and live the life they know their spouse would have wanted for them? How does one allow their heart to love again knowing the pain that could come with such a gift? Especially when Val is the exact opposite of Andi in every way? Val grew up knowing nothing of her heritage or the "family business" where Andi knew from the get-go what would be expected of her. This story had everything that makes for a best-seller. It has characters who are flawed, it has moments that rip your heart out and leave you teary eyed and asking why. Then it flips the script and gives you something that is so wonderfully witty that you find yourself laughing out loud. There are struggles to overcome (both internal and external), and at the end of it you are left feeling like you were taken on one amazing journey. The downside to such an amazing story? The next in the series isn't scheduled for release until the summer of 2017. That in itself is a torture only the Eagle Elite men can bestow. 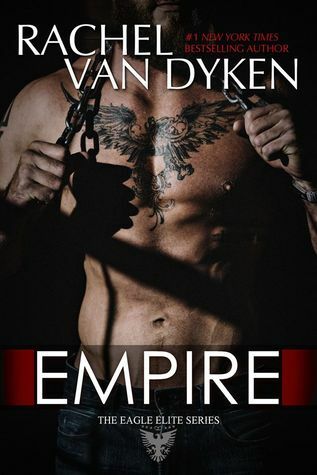 As always, I would highly recommend this novel to not only fans of Ms.Van Dyken, but also to those who enjoy a good, complex novel that will grip you tight and take you on a well-written and engaging ride. Although if you are new to Eagle Elite - you really need to start at the beginning).